Model: L-164B (or C) "Marine Meter II"
Underwater meters were around for years, but typically they were simple meters which were sealed into a heavy plastic case that could withstand water pressure to a reasonable depth. These show up on eBay fairly often; I often see a Weston Pixie with an underwater jacket. This is the only meter than I'm currently aware of which appears to be purpose-built for use underwater (up to about 200 feet, according to the literature). It's large and very easy to read. The controls are on the bag, in the form of two largish, contoured knobs which can be easily turned by hands in gloves. The cell is located in a tube that looks directly out the rear, so you simply hold this thing up to eye level as if you were going to read the meter face, and that's what you're aiming at. Setting it easy. If you pull the black knob out and turn it, the ASA/DIN speed turns and you can set your film speed. At normal position, turning the knob cranks the calculator dial around. The red knob is the on/off and battery check. So you turn it on, aim it, and then you turn the calculator so that either the ƒ/stop you want is matched to the pointer, in which case it tells you the shutter speed to use on the bottom, or you pick the shutter speed against the pointer on the bottom, and read the ƒ/stop that the needle points to at the top. There are three versions: the original L-164 Marine Meter, which is functionally and cosmetically different (albiet not that much). 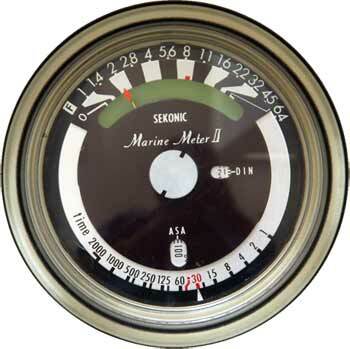 Then there's the Marine Meter II, which came in both a B and C model. I don't know which one I have, as it's not marked on the meter itself. Sekonic had both instruction manuals available so I downloaded both, and the manuals are identical. The only difference appears to be that the B model was made when Sekonic was being distributed by Copal, and the C model was after Copal left the picture. I put the C version on download page (click the PDF icon above) but you can get both at Sekonic's site and see for yourself. According to their website, Sekonic ended production back in 1993, though I read somewhere that they were being made again (at least as of around 2001). These meters are surprisingly pricey (if they work). Good ones typically fetch in the $50 range on eBay, which is unusual for this vintage, and considering that they're CdS meters which take the dreaded PX-13.